UberBlox is a new high-quality metal construction set and prototyping system for makers to build rigid structures and automated machines. At the heart of the system is a new single-connector locking mechanism which uses a common small tool to quickly and precisely lock each block to the next. 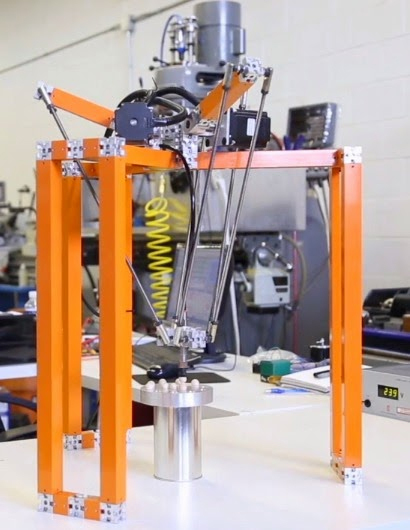 The firmly connected blocks provide accurate, strong and rigid frames for a wide variety of structures and complex machines such as robots, CNC machines and 3D printers. Do you have a date for when your Kickstarter campaign will begin? Any details about the campaign you're ready to share? We plan to launch sometime in early March, barring unforeseen issue. The campaign will last 30 days and will be available internationally. Reward shipping will be free within the U.S., International shipping will be extra and added accordingly. Other specific details will be revealed at launch. Does UberBlox come with its own software? Or were the software demos in the video from an external modelling tool? The models in the video were done with a third-party package. We do have most of the catalog of UberBlox parts and components (which are growing) modeled in 3D and will be making those available in popular formats to backers at some point in time. Having said that, if we do reach our KS goal, we have several key stretch goals one of which is the development of a custom easy-to-use 3D software tool specific to UberBlox parts and components that will allow users to virtually build structures and machines quickly without prior CAD experience, by simply dragging and dropping parts from a virtual toolbox and snapping them together as they build their UberBlox system. The software would then create a Bill-of-Materials for them that gets sent to us directly so that they can get their needed parts for their design and build it physically. The software would be available for free to all users. Other than my background in mechanical engineering, I have been involved in 3D software application development for nearly 25 years now, having worked on similar successful projects, so it will be a natural fit for us to handle the development of such a system with relative confidence in our ability to execute it efficiently and correctly. What's the background behind the system? I mean, why create it (coolness aside)? It is difficult to make automated machines without years of developing skills and know-how. You need to know about technical design principles, not to mention the skills required to fabricate and assemble parts accurately to make such complicated machines work. With the maker movement in full swing, there seems to be a need by many for a solid system to enable makers to build and test machines such as 3D printers, robots, and CNC machines, quickly and accurately, without necessarily having the deep technical knowledge and skills needed for designing and building one from scratch. None of the traditional plastic building block sets can support the kind of rigidity and accuracy these types of machines demand, yet they are great for quickly and easily making something. UberBlox uses the same philosophy of traditional plastic building blocks, by having largely a single connection method and discrete parts and components, yet supports the strength, rigidity, and accuracy requirements of systems used by those with much higher technical skills and background. It bridges the gap between these two worlds and makes something as complicated as designing and making an automated machine, accessible to most who are interested in learning or improving machine-building skills, or want a fast and robust way of designing, building, and testing their ideas. Can you offer any other examples, besides 3D printers, of things you see people being able to build with this system? Why, on that note, would someone want to make a 3D printer out of UberBlox instead of buying one? Most types of robots, including manipulator arms, deltas, rovers, humanoids, hexapods, pick-and-place, as well as sliders, CNC milling/routing, laser cutting/engraving, just to name a few, are easily supported by the system. Anyone strictly interested in using a 3D printer to print parts, may choose to simply buy one readily available. There are those however that have a desire to make their own so that they can learn engineering and technical skills as well as be able to tweak their system however they like. Also, many in the maker community like to come up with new design ideas for either entire 3D printing systems or portions of them. After all, that is one of the reasons we’ve had such an explosion in interest in low-cost 3D printers in the past couple of years. UberBlox is a natural fit to allow them to quickly test a design without getting bogged down in the fabrication process and technical details needed to do a scratch build. Even with today’s readily available aluminum T-slot mechanisms, you still need to cut, drill, mill, fit, re-try, re-cut, deal with a huge number of choices for connecting parts, and do all this accurately with tools and equipment that you may not necessarily have easy access to or know how to operate properly. UberBlox eliminates all that. You simply imagine a machine idea within the context of the system, and you start assembling parts, mostly with a single small tool. The supporting electro-mechanic, electronic, and software components then help you bring it to life. Could you clarify this statement: "Our control components are built around popular boards such as Arduino and Raspberry Pi." Do you mean that they're included in the set? Or you've just made sure they can be hooked up to run the show without any messy "hacking" of the component design? Or something else? Yes, our controllers as UberBlox-compatible physically and already contain the microcontrollers in them, wired and interfaced neatly and logically to the outside world with input/output ports and switches/indicators. We will be offering several control boxes, which we refer to as UberBlox “Brain-Boxes” for various applications. There is a small family of interchangeable Brain-Boxes. For example, there is a specific Brain-Box for 3D printers, one for CNC machines (different Brain-Boxes for various size machines to accommodate power requirements as needed), smaller Brain-Boxes for simple control of a single stepper for sliders for example, and so on.